1. First, measure and mark the center of the jar's lid. 2. Using a 1/2" high-speed steel drill bit, drill a hole to fit the width of a soap dispenser pump. You can use the pumps from old lotion bottles, etc. 3. 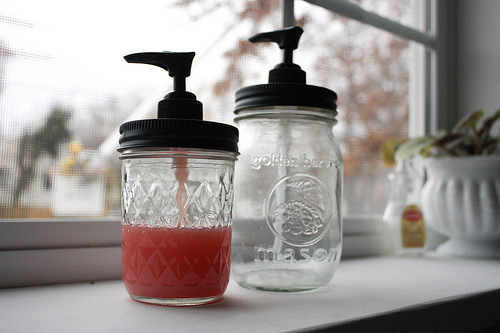 Fill the jar with liquid soap, screw the lid back on, and insert the pump. You may need to trim the bottom of the pump to fit your jar. If so, cut at an slight angle. Love it, any tried and true recipes for soap? This would make a super cute holiday gift.